Titanium, ceramic and rubber transform time into reality in a new way. Titanium, ceramic and rubber transform time into reality in a new way. With its case made of 18 karat rose gold, the Patravi TravelTec FourX Limited Edition hovers between the terrestrial and the cosmic levels. Jet black, extra-hard, high-tech ceramic turns the bezel into a striking statement. The monopusher is made of titanium; the crown, the chronograph push-pieces and the strap are made of hard-wearing rubber. The painstaking skeleton dial with its sophisticated date indication under an effective magnifier completes the technical look of this extraordinary overall concept. The figures are milled out of the date room and remain invisible until they appear in the date window with the red background. 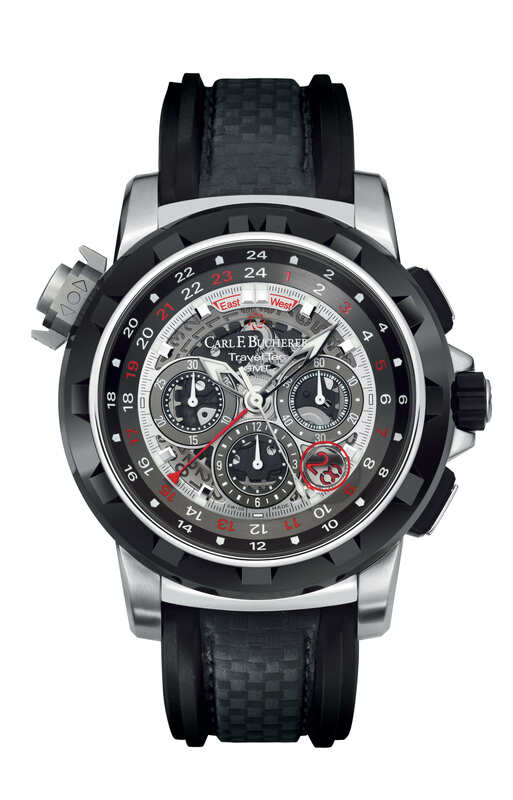 The model Patravi TravelTec FourX, in a Limited Edition of 125, once again does honor to Carl F. Bucherer. This timepiece is designed as a tribute to the great visionary, the depth of his character and the creativity of his company. Your journey through time can begin. With the push of a button, the inner ring for the 3rd time zone can be turned forward or backward (east or west) in one-hour steps, depending on the position of the sophisticated switch mechanism. A third, neutral position prevents the display from being set unintentionally. This construction results in fast and precise wheel movement as well as great ease of use. The push button mechanism is visible through an aperture in the side of the watchcase.